There are usually many ways to solve the same problem. If you want a more efficient home, you might reduce your energy waste by having an electrical timer installed to turn off your heating and air when you’re not home. You might install efficient home siding or replace old and drafty windows. When looking for the right solution, consider the hidden benefits of each option. For example, energy efficient windows do more than just reduce your heating and cooling bills. Although energy savings might be your primary goal, there are additional features and perks that you might need. Double-pane windows have two durable sheets of glass within a single window frame. There is a space in-between the two window panes to provide an extra layer of insulation. This space can be filled with argon gas for even greater protection. Although highly efficient, double-paned windows also increase the amount of natural light in the home—especially when you choose an open design like a bay or bow window! Triple-pane windows are constructed similarly to double-pane windows. The difference is an added layer of protection that keeps your window temperature closer to that of your home’s walls. For example, on a cold day, your widows will only be a few degrees cooler to the touch than the walls they inhabit—creating a much more comfortable space. EcoView Windows are constructed with highly-durable and energy-efficient glass called SolarFlect Insulating Glass, also known as Low-E Glass. Not only does this feature greatly reduce your energy costs, you will benefit from UV ray protection. This keeps your carpets and furniture safeguarded against fading when placed in direct sunlight. 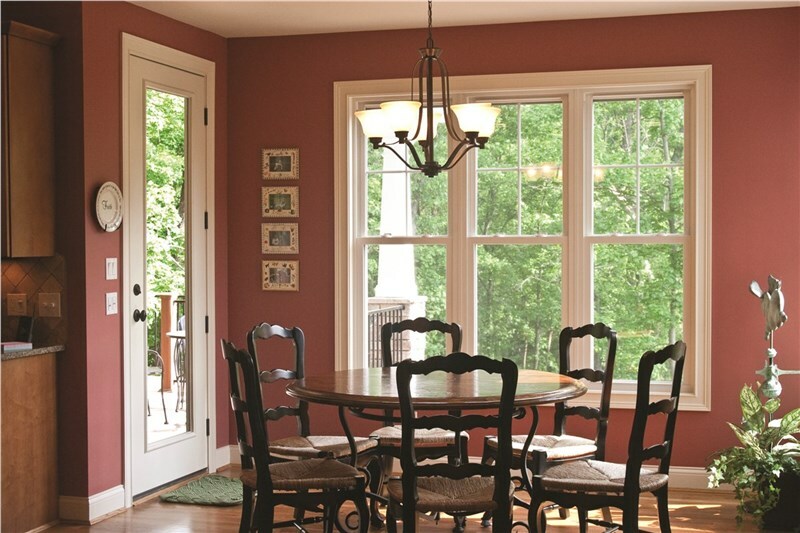 For the best protection possible, EcoView windows are constructed with vinyl frames and sashes. This not only adds even more insulation and energy-savings, you are also getting highly-durable windows that will withstand harsh weather conditions for many years. Energy efficient vinyl windows are also shockingly easy to clean and maintain; who doesn’t love that!? When you want the best energy efficient replacement widows that do much more than reduce your energy costs, go with EcoView! Our energy efficient vinyl windows are stylish, durable, made to protect your furnishings, low-maintenance and more. Get started today with a free, no-obligation estimate!